Carl’s Jr. has had no qualms about pushing its meaty monstrosities onto the gorgeous woman-loving public with a string of ads featuring beautiful women pretending to dine on its wares. And even though the restaurant chain recently catered to gamers with a Call Of Duty-inspired combo (comprising corporate synergy, among other things), we couldn’t have guessed that a pair of animated adventurers would succeed a bevy of beauties as Carl’s Jr. spokespeople. But that’s exactly what’s happening in this new ad, which features Rick Sanchez and Morty Smith of Rick And Morty. 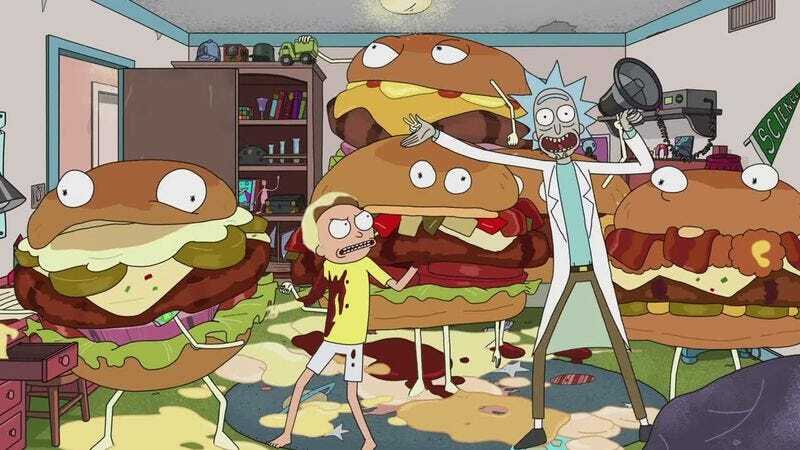 The commercial sees Rick burst into Morty’s room with the news that they’re now in the advertising business as sloppy sandwiches like the Tex Mex Bacon Thick Burger parade into the room to steal things. Rick seems oddly thrilled, but we’re pretty sure eating one of those gastronomical time bombs would elicit a “wubba lubba dub dub” or two.